* Colon cancer is a tumor(s) consisting of gastrointestinal cells that have ‘mistakes’ in their DNA or genetic coding and reproduce at an abnormal rate. If left to progress, the cells in the tumor may spread to the lymph nodes and to other organs in the body where they will continue to multiply and may develop their own system of blood vessels, taking nutrients away from other areas of the body. If left unchecked, the cancer will eventually lead to illness and death. * Causes or risk factors increasing the likelihood of colon cancer include chronic inflammatory bowel disease, a build up of toxins in the colon, polyps in the colon, prolonged constipation and or diarrhea, age, diet and obesity. Exposure to radiation and pesticides, a depressed immune system, prolonged or continual emotional or mental stress, smoking and heredity have also been linked with cancer. 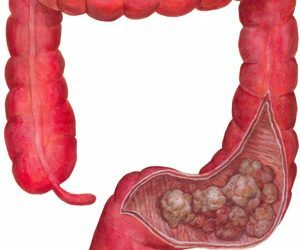 * Symptoms of colon cancer include diarrhea, constipation, rectal bleeding, blood in the stool, pains in the abdomen or stomach. Some of these symptoms are common to other bowel disorders; it is important that you seek medical advice for a correct diagnosis. * Have a Checkup – it is recommended if you have a family history of colon cancer and/or have polyps, that you have a screening before the age of fifty. * Dietary Changes – diet may be one of the best preventative measures you can take against colon cancer. If you have been diagnosed with colon cancer, making positive dietary changes that will help your body to cope better with chemotherapy, radiation or surgery and reduce the factors that cause disease. – Take in a high fiber diet, at least 35 gms daily. Fiber is known to reduce the risk of cancer by acting as a laxative, thus reducing the time toxins are spent in the colon. A high fiber intake is associated with decreased polyp formation in the colon. – Eliminate animal flesh products. Animals are often treated with hormones and consume foods contaminated with pesticides; these chemicals are taken into your body when you eat meat and other animal products. Many studies have found a direct correlation between high intake of animal protein and breast, colon, prostate and endometrial cancer. * Eat a vegetarian centered diet including whole grains, legumes, oats, onions, berries, garlic, broccoli, carrots, sweet potato, brussel sprouts, nuts, seeds, yams, pumpkin and leafy green vegetables. There are some therapies available to treat colon cancer. Conventional therapies include surgery – removal of the tumor; radiation – radiation of the tumor; and chemotherapy – drug therapy. The treatment used depends upon how advanced the cancer is and will have many side effects. It is necessary to include other therapies such as diet, vitamin, mineral and herbal therapies into your regimen to improve the chances of a successful recovery. Please consult your nutrition oriented physician for further information. If colon cancer is diagnosed and treated early enough in its progression, it is possible to go on and lead a normal life after treatment. It is worth noting that the healthier a body is before, during and after treatment, the better the chances are of avoiding or overcoming colon cancer. * Consider seeing a qualified Chinese Herbal medicine practitioner. VITAMIN A – Contains anticarcinogenic phytochemicals shown to reduce the risk of some cancers. Vitamin A helps stimulate the immune system and is used in tissue repair. Natural sources of vitamin A include yellow fruits and vegetables, rose hip, sage, spinach, spirulina, alfalfa, asparagus, dandelion greens, red peppers, apricots and peaches. 50,000 – 100,000 iu for ten days in divided doses of emulsion form, reduced to 50,000 iu for thirty days, and 25,000 iu daily after that, may help if you have colon cancer otherwise take according to label instructions. Doses over 10,000 iu per day may cause birth defects if taken by pregnant women. Women of childbearing age are advised not to become pregnant during such a course or within one month after ceasing a course. * Vitamin B Complex – is used to build red blood cells, helps the liver to detoxify the blood, used for healthy cell function and reproduction, and improves circulation. 100 mg daily in divided doses may help. VITAMIN C – With bioflavonoids. Vitamin C is thought to reduce the risk of cancer and to lower death rates of cancer sufferers due to its antioxidant properties, which protect tissue from damage caused by free radicals. Vitamin C may also be used to prevent damaging side effects from chemotherapy and radiation. Natural sources of vitamin C include citrus fruits, berries, alfalfa, fenugreek, parsley, peppermint, tomatoes, pineapple, papayas, kale, spinach, brussel sprouts, onions, mangos, peas, persimmons and kelp. 5,000 – 20,000 daily in divided doses may help if you have colon cancer otherwise take according to label instructions. Do not use more than 5,000 mg daily if pregnant. Use esterified vitamin C if you use aspirin. Large doses of vitamin C may cause diarrhea, may deplete the body of copper and affect the reliability of oral contraceptives. VITAMIN E – Helps to reduce the risk of cancer as the antioxidant properties protect cell membranes from attack from free radicals and is used in cell repair – important if you are undergoing chemotherapy, radiation or surgery. Natural sources of vitamin E include dark green leafy vegetables, cornmeal, milk, sweet potatoes, flaxseed, dandelion, soybeans, legumes, cold pressed vegetable oils, nuts, whole grains and seeds. 400 – 1,000 iu daily may help if you have colon cancer otherwise take according to label instructions. BETA CAROTENE – Protects against cancer by scavenging free radicals and is needed to repair tissue. 25,000 iu daily may help if you have colon cancer; otherwise take according to label instructions. SELENIUM – Some studies have shown that people who have a diet low in selenium have increased risk of developing cancer. Selenium works synergistically with vitamin C and A, has a powerful antioxidant effect and aids in digesting protein. Natural sources of selenium include dairy products, garlic, molasses, kelp, nettle, ginseng, fenugreek, fennel seed, chamomile, wheat germ, brown rice, alfalfa, whole grains and sarsaparilla. 200 mcg daily in divided doses may help if you have colon cancer otherwise take according to label instructions. CAT’S CLAW, UÑA DE GATO – Has an antioxidant effect, cleanses the intestines, and helps in cancer and intestinal problems. Use according to label instructions. Do not use if you are pregnant. DANDELION – It is thought to reduce the risk of cancer. Take according to label instructions. Avoid dandelion if you have ulcers or gall stones. GARLIC – Stimulates the immune system, detoxifies the body, improves circulation and is used for cancer. Take 2 – 3 capsules daily in divided doses. Seek medical advice before taking garlic if you are taking anticoagulant medication. GINGER – Helps to alleviate nausea and vomiting which is experienced with chemotherapy and radiation, cleanses the colon, improves circulation and is used for bowel disorders. 1 gm daily in divided doses may help. Do not use for a prolonged period during pregnancy or if you have gallstones. PAU D’ARCO, TAHEEBO, LAPACHO – Used in cancer and inflammatory bowel disease. Has healing and cleansing properties. Use according to label instructions. RED CLOVER – Is used for inflammatory bowel disorders, and is a blood purifier. Use according to label instructions.